All the riches on earth can’t buy redemption. 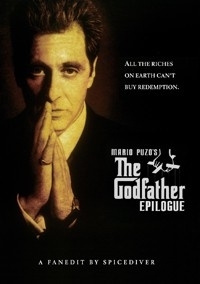 Although there are a number of fairly major changes from Godfather III to The Godfather Epilogue, many of the cuts, redubs and rearranged scenes are relatively small refinements; the kind of polishing that the writers, director and editors might have made themselves given more time. Francis Ford Coppola's The Godfather Part III is a rich and often powerful work, although an obviously flawed one. The Godfather Epilogue is one faneditor's attempt to make this good film just a little bit better and create a more worthy epilogue to the first two films. Unlike Parts I and II, the creation The Godfather Part III was rushed: the scripting, the production, the edit, everything. In fact filming started without a finished script. Against Coppola's wishes, Paramount set a Christmas 1990 release date - he wanted April 1991 - and by this stage of his career he lacked the clout that would have allowed him to dictate a longer timeline. The studio also insisted the film be called "Part III", whereas Coppola regarded the main chapters of the Corleone family story to have already been told in Parts I and II. Part III, he says, is really an epilogue. This fanedit is thus renamed in the spirit of Coppola's vision for the final story. 1. The reconstructed opening. The edit features a reconstruction of the cut opening scene from GIII, featuring Michael Corleone's and the Archbishop's business deal. This scene was cut before theatrical release and placed in a shortened, re-arranged form at around the 40 minute mark, thus confusing the narrative up to that point. For the restoration, a mix of lower-resolution deleted footage and full-resolution official footage has been used, including shots from the original GIII trailer. The film's first hour now makes more sense overall and casts Michael's relationship with the Church in a fundamentally different light, as was originally intended. 2. Deleting Andrew Hagen. Two pointless scenes featuring the poorly written character of Andrew Hagen - son of the absent Tom Hagan (Robert Duvall) - have been cut. Early in the film we learn that Tom is long dead and that his son has become a priest and wants work in Rome one day. That's all we need to know. His (non-speaking) reappearance with the Corleone family at the opera house during film's final act was impossible to edit out, but his presence there is not jarring. 3. Relationships. There are many small edits and a few redubs made to some of the intimate relationship scenes featuring Vincent and Mary, and Michael and Kay. The changes are intended to make the scenes ring more true and move them away from soap opera. The cuts also rid the film of some of Sofia Coppola's worst acting moments. * In hospital, Kay now doesn’t thank Michael *again* for letting Anthony go. Too sentimental. Their relationship has not thawed enough at this point. * Mary and Vincent's cafe scene now features less unconvincing and cutesy small talk. * Mary’s visit to Vincent in his bar/hideout is now minus several childish lines from Mary. There are no awkward closeups and no "I love you cuz" etc. We already know how they're feeling about each other. * When Vincent dumps Mary, his melodramatic line "Go love someone else" has been deleted. Again, the visuals do the talking. * In the Sicily scenes Kay and Michael do not dance in the town square at a stranger's wedding. It’s too sentimental and doesn't quite ring true. 4. Vincent selling his soul to Don Altobello. The scene where Vincent pretends to sell his soul to Don Altobello to learn about the Don's Italian connections has been moved to later in the film. This allows a shorter passing of time between Vincent's mission and his reporting back to Michael with news of Altobello's treachery. In the original cut of GIII, the dramatic impact of this subplot was diluted by these two scenes being placed too far apart. To compliment this change, many other scenes in the middle act of the movie have also been shifted about to streamline and sharpen the narrative. 5. The welcome party in Sicily. The welcome party for the Corleone’s in Sicily is now a single unbroken sequence, rather than being inexplicably split by a business meeting scene. 6. Vincent the street hood. Several lines of dialogue that are out of character for the toughened street kid that is Vincent Mancini have been cut. eg. he would never say of his enemies "these people are animals" and "these people are crooks". No matter how much he's learning under Michael's tutorage, he's a creature of the street. 7. The successful Immobiliare deal. The scene in the opera house foyer where Michael learns that the new Pope has okayed his big business deal has been cut. *But* most of the dialogue from this scene has been re-dubbed into a later scene where (originally) Michael received news about a "plot against the Pope". That plot is already eloquently portrayed by footage of events at the Vatican, so the original dialogue is unnecessary. Instead, the redubbed audio in this scene gives Michael the good news about the Immobiliare deal and simply hints at the general danger the new Pope faces for backing Corleone. 8. Michael's thoughts of redemption. Michael's closing line to Connie about his confession with Cardinal Lamberto ("He changed things") has been deleted. Michael is certainly affected by his confession, but he is not changed...yet. He still has some scheming to do at that point in the story ie. the relocated scene where he sends Vincent to trick Don Altobello (see point 4 above). Michael doesn't vow his redemption to God "on the lives of his children" until later in the story when he's mourning beside Don Thomasino's coffin, a vow that is undone minutes later when he learns of the assassination plot against him and promotes Vincent to do his dirty work. 9. Mary's death. The climactic scene on the opera house steps contains quite a few continuity errors and was obviously filmed multiple times in different configurations. Most of these errors have been fixed. The scene has also been considerably tightened for dramatic impact. There are also subtle changes to the reaction shots of Kay, Vincent and Connie to Michael's "silent scream", to make those reactions feel more natural and understated. * Several of Michael’s jokes have been deleted. These are possible improvisations by Pacino Mark II and they don’t suit the character. * Deleted a confusing line from Cardinal Lamberto during Michael's confession scene in the garden. * Deleted Michael's line "Someday I may ask you to do a service for me" when Don Thomasino's bodyguard asks for revenge after his master's murder. It's a lazy repeat of an iconic line from the first Godfather film and not the words of a man contemplating redemption. * Deleted some of Michael's rambling as he sits by Don Thomasino's coffin. Less is more. * Deleted Michael's line about corrupt Italian politicians: "They're the true mafia". Michael is too subtle a character to make such a transparent remark. * Deleted Vincent's line to Connie: "I'll have everything ready" which is delivered like a cartoon villain. * Deleted Michael's voiceover line about Mary: "I would burn in hell to keep you safe". A weak attempt to telegraph the film's ending; she's in absolutely no danger at this early point in the story. *Cut Andy Garcia's ham-fisted "ZASA!" when he shoots Joey. *Cut Al Neri stroking his gun on the train. I was excited to find out that Spicediver made an edit of Godfather Part III. I was disheartened though when I saw he only cut 8 minutes and the cuts made were mainly to polish the film. Godfather III is terrible and can probably never be saved fully. So I watched The Godfather Epilogue hoping that the minor tweaks could at least make it more enjoyable. The restructured opening. I loved the way you cut together the alternate opening. This is how Godfather III should have started, without a doubt. The overall tightening of the storyline and characters. Mary looking at obvious movie stills of Apollonia in Michael’s scrapbook. Al Neri stroking his gun on the plane. These may seem minor but they really bothered me. Sorry. 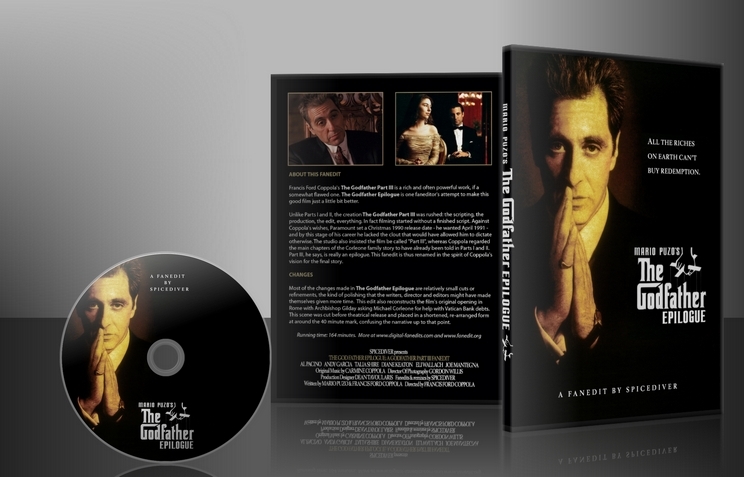 Just a note to say that the revised version if the Godfather Epilogue released January 2013 addresses most of these points raised by Neglify, and includes some additional changes and remixes as well. Running time is now approx. 160 minutes. The Godfather Part 3 was always the least likable of the three films. It was made because Coppola needed money, and so he took the execs up on making another follow up. The script was rushed and so was the production. To top it all off, Robert Duvall did not return as Tom Hagen. I’ve been waiting for a good fan edit of this film, and I think this is as good as it can get. The cuts and remixes, while not extreme at all, do a lot to polish this film into something more worthy to be called Godfather. The title is much more appropriate, as that is what this film is…an epilogue. This feels more like a Godfather film than before. I can’t say Duvall’s absence isn’t still felt, and I can’t say I like Vincent’s character a whole lot more than I did before, but I’d definitely rather watch this than the original. Final Score: 9 out of 10.